The accident happened to submarine Alrosa proves again the fact well-known among experts – Russian Black Sea Fleet is not reviving at all but quite the reverse. The only difference is that we hear rise-from-knees hymn instead of funeral march. 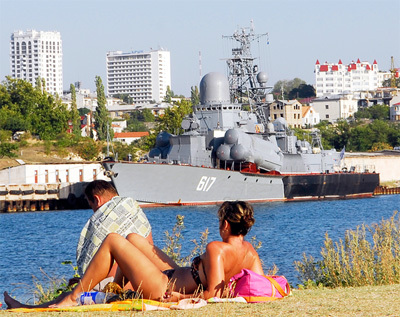 Presently, about 30 percent of the fleet's ships are barely mission-capable – almost all Sevastopol kids know that. Our special correspondent has also made certain of that while being to Crimea. In fact, current BSF is a fleet without aviation, subs (Russia has not any submarines at the Black Sea after Alrosa accident) and shipyards. The only feather in the cap is a guided missile cruiser which resembles rather floating target than deployable warship. A static target, though, as the cruiser spends most of the time not at sea but at moorage wall or under repair. Many questions drop when you look at warships closely, especially from within. I managed to make such excursion thanks to my friends among officers (for good reason I won't tell their names, ranks and ships). The only fact is that I've visited Russian and Ukrainian ships of one class and of the same age. As well as the same conditions – their equipment and facilities are equally obsolete, even archaic. I took a look at marking and it was so – 1970-ies, although I noticed somewhere seemingly new devices marked in middle 80-ies. The sailors shrugged shoulders: "What hardware should be when ships are obsolete in whole?" But what about notorious modernization? After upgrade the ships are like-new, aren't they? The answer was: "Ships are stretchless – you can't cram everything inside. And they are not ageless either – it is impossible to fully upgrade 30- or even 40-year old construction designed for certain lifetime and other conditions, weapons and hardware made in 1960-1970-ies. Of course, a warship is a combat platform, but with limited service life and capabilities. Those ships [officers pointed at missile cruiser Moskva, large ASW ship Smetlivy and Ukrainian frigates] have depleted their resources for upgrade. Obviously, one may replace 35-year old weapon with the "newest" one made quarter century ago. So what?" Large ASW ship Ochakov: last moorage before disposition? Heh, dead and gone the days when the words "wealth and glory" were about Black Sea Fleet... By the time of USSR breakup there were four cruisers on BSF roll: two guided missile cruisers – Admiral Golovko and Slava (later renamed for Moskva), ASW cruiser Moskva and light cruiser Mikhail Kutuzov. However, there was a fifth one – Admiral Flota Lobov; it was launched in August 1990 but was not commissioned formally. Besides, that roll contained 11 large antisubmarine warfare (ASW) ships. In foreign navies this class is known as destroyers, but the Soviets were proud of their own "special" name for this class. Moreover, there were somewhat 12 (as for one source) or 40 (as for another one) frigates; 24-40 submarines. It's hard to count ships of other classes – there were immense herds of them – 55 various landing vessels, 32 guided missile ships and 24 small ASW ships; somewhat 30 or even 70 minesweepers; up to 800 auxiliary vessels; and over 400 naval aircrafts. That's the main course; the dessert was heavy aircraft carrying cruiser Admiral Flota Sovetskogo Soyuza Nikolai Kuznetsov standing at Nikolayev and itemized in Northern Fleet; same type cruiser Varyag was on final stage of construction. BSF personnel strength was around 75-100 thousands then. Generally, that fleet was dominant in the Black Sea and obviously outclassed Turkish Navy – the only "opponent" – both in number of ships and combat capabilities. Honestly, even that power delighted only amateurs and sensitive womankind regularly greeted lines of thundering and saluting ships during naval parades. However, all admirals were sure that Black Sea Fleet was not in best conditions even at that time. Its power would be probably enough to fight only against the Turkish as by that time the fleet's development died out; there were no new ships and old ones were maintained as usual – carelessly and from time to time. Comparing to the time before mid 80-ies, the ships less and less sailed distant cruises and took the sea at all, although there were more and more contingencies and emergencies. For example, on August 30, 1974 during naval exercise near Sevastopol a SAM cruise engine spontaneously operated at large ASW ship Otvazhny; stern ammo room exploded and caused a fire; consequently, the ship sank after 5.5 hours of damage control and 24 sailors died. On February 2, 1975 a superfire occurred on ASW cruiser Moskva moored at Severnaya Harbor of Sevastopol. The explosion of the ship's load would smash a half of the city, but luckily after 7 hours of firefighting the ammo room was saved; there were victims, of course. Destroyer Sovershenny was also on fire. In 1981 supply vessel Berezina collided with another ship at Bosphorus Strait and turned back to base. 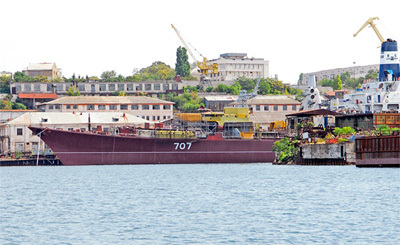 But on the way to Sevastopol a fire occurred on the semi-sunk vessel. The 4-hour fire was brought under control thanks to titanic efforts of salvage team; miraculously, the ammo storage with hundreds of tonnes of ammunition did not explode. All in all, everything was as usual. While a number of diplomas and works about landing operations at Bosphorus Strait were successfully written and endorsed at Soviet military academies, naval leaders unlikely cherished illusions on that matter. They knew better how vulnerable the Soviet Black Sea Fleet was in its Sevastopol "mousetrap". The fleet had access to the Mediterranean only in peacetime – in case of war against NATO it would instantly become a clay pigeon without a chance to escape from Black Sea trap. What escape are we talking about? BSF would be rapidly incapacitated after defeating its key ships by missile and air strikes in non-contact battles. Since that was obvious to Soviet admirals, only imaginary attention was given to Black Sea Fleet during last two decades of USSR epoch. The fleet was not supplied with new ships and had nothing but supportive strategic mission – at H-hour it was supposed to face an attack and draw the part of opponent's force. In sum, the fleet was beautiful but minor, although it was based in warm site, wonderful to serve and to live the sunset of life. Nevertheless, the Soviet Union died suddenly in August 1991, but BSF remained. It had plenty of ships and seemed tidbit to nonpros like all post-Soviet politicians. The first who tried to take a nibble were members of Ukrainian Supreme Soviet as early as October 1991, and then things were up and running. In January 1992, when Kiev required 50% of former Soviet Black Sea Fleet, Marshal of aviation Evgeny Shaposhnikov asked Ukrainian President Leonid Kravchuk: "In what certain strength and for what certain missions does your country plan to create its own navy?" Kravchuk did not even understand the question... The carve-up lasted till 1997. Kiev and Moscow nimbly played tug-of-war and sometimes were on the precipice of battle action. And nobody cared there was nothing to do with that gold alone – even Soviet Union couldn't manage to keep Black Sea Fleet in somewhat proper condition. The fleet is not only ships but huge infrastructure, too – net of berths, barracks, airdromes, ranges, services, communication lines, light stations, ammo and arms depots, fuel storages, outfitting stock points, shipyards and so forth. All those things had to be maintained, personnel needed to be fed-dressed-staked-trained and housed. Moreover, by no means cheap warships had to take the sea and be deployed time to time, as a matter of fact. At moorage any fleet rots, rusts, decomposes and dies. But the main point is that any fleet must exist and evolve under meaningful strategy. The Soviet one – core of Black Sea Fleet – rests in peace with the USSR; a new one failed to appear at both countries. However, kicking off the carve-up, politicians should have thought twice whether the game was worth the candle. But that's talking point of the following part.